RSVP cards are crucial for totting up the yeahs and the neighs! This will ensure you do not overspend and your day runs smoothly. We produce separate RSVP cards to match our gatefold and flat invitations such as the one above from our Candy Stripe Vintage range. 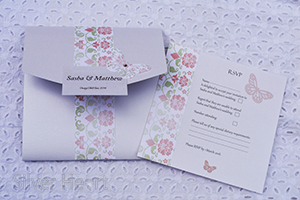 We also produce RSVP inserts that match our long and square pocketfold cards, as shown in the example above from our Broderie Antique Rose Range. 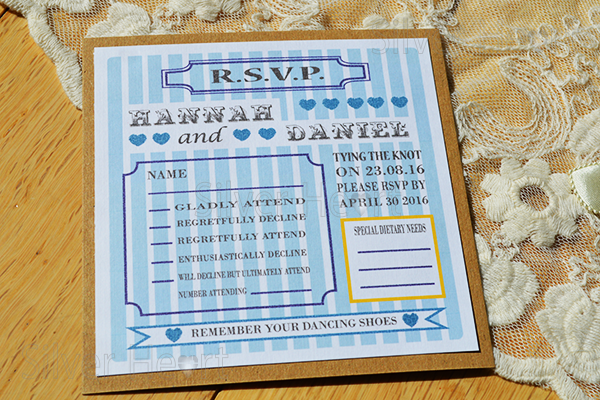 RSVPs come as standard if you purchase invitations in either of the square or long pocketfold formats, along with an invitation. 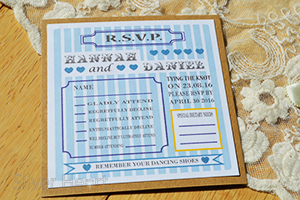 Our chequebook invitations also have RSVP inserts as standard as in the example above from our Ditsy Daisy range. 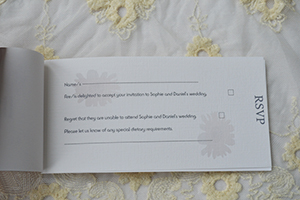 The wording of your RSVP is of course customised to suit you. We have included a humorous tick list on the Candy Stripe Vintage card, but you may have your own ideas for pinning down who is coming and who isn't. It is often useful to include a question about special dietary needs if you are going to be feeding your guests as you wouldn't want to ignore Great Aunt Gladys who won't eat anything red, or a vegetarian colleague. There is nothing grumpier than a hungry guest.